Raquel Allegra was born in Berkeley, California to artisan parents who encouraged creative experimentation. Today, this process of constantly evolving of techniques and materials is continued on in her eponymous clothing label. Shredded and deconstructed from the beginning, her clothing remains true in her casual, laid-back style. 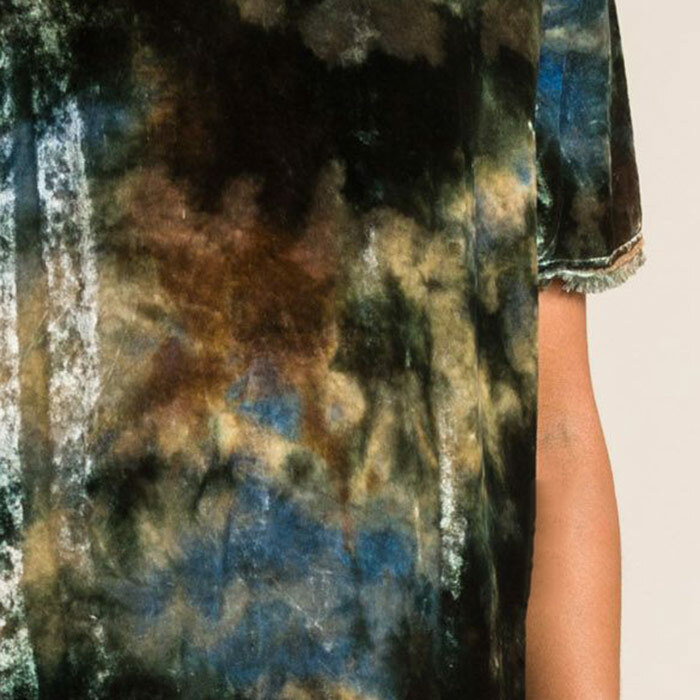 Unique and experimental tie-dying is frequently used, which is all dyed by hand in Los Angeles. Each collections is one season evolving into the next, introducing new materials and treatments. Rarely taking on muses, Raquel Allegra’s Fall/Winter 2017 collection was inspired by the movie Belladona of Sadness, a 1970s Japanese dramatic animation of a woman’s journey of self-discovery. This journey had resonated with Raquel during her own trip to Costa Rica. The animation uses watercolor, familiar to the tie-dye effect used in her work. This inspiration results in a sultry palette of relaxed silhouettes with distressed accents and raw edges. 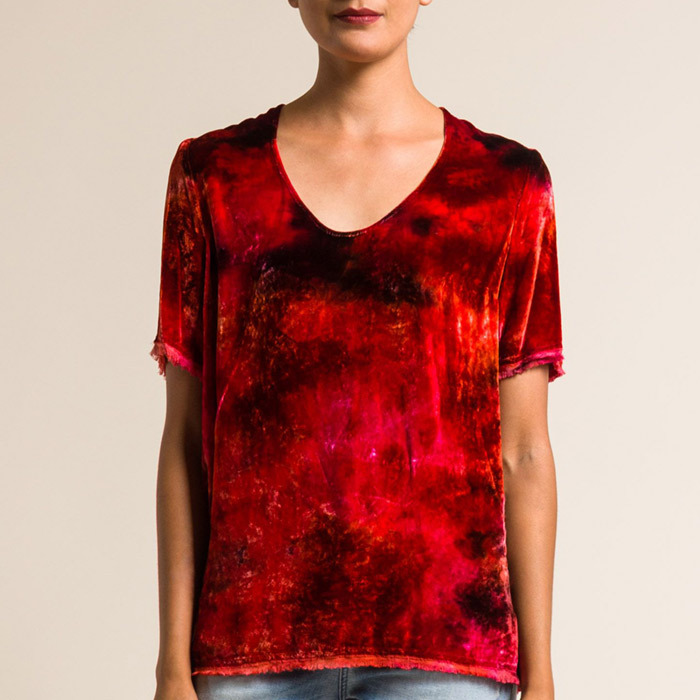 Tie-dyed velvet in ruby red, forest green, and storm blue are made into asymmetrical hem tops or tunics with raw edges, double layered with silk. The velvet in midnight blue is also used in a trench coat, lined with tie-dyed silk. 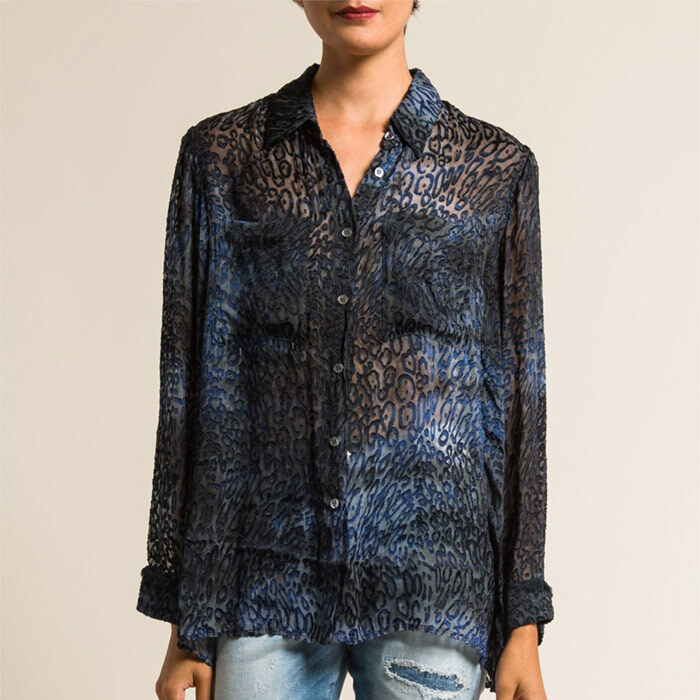 A loose and draped button-up shirt is made with a sheer silk base with woven viscose that was negatively burned to create leopard print pattern. This raw elegance speaks to multiple walks of life, appropriate for different occasions. It is casual, avant-garde, and feminine in a bold and sophisticated color palette. It can be dressy or laid-back with a unique and edgy touch.